You want to make sure your Point of Sale can accept and process a credit card. Some POS systems have a built-in credit card processing routine while others may interface to third party software. You may also use a credit card terminal which is totally separate for your POS (shown right). These are not recommended since they usually have a rental fee associated with them. You will also have to re-enter your credit card approval codes into the Point of Sale to complete your tender by using a free-standing terminal. A credit card system is a type of retail transaction settlement and credit system, named after the small plastic card issued to users of the system. A credit card is different from a debit card in that it does not remove money from the users' account after every transaction. In the case of credit cards, the issuer lends money to the consumer (or the user). It is also different from a charge card (though this name is sometimes used by the public to describe credit cards), which requires the balance to be paid in full each month. In contrast, a credit card allows the consumer to 'revolve' their balance, at the cost of having interest charged. 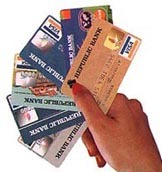 Most credit cards are the same shape and size, as specified by the ISO 7810 standard. A user is issued a credit card after an account has been approved by the credit provider (often a general bank, but sometimes a captive bank created to issue a particular brand of credit card, such as Wells Fargo or American Express Centurion Bank), with which the user will be able to make purchases from merchants accepting that credit card up to a pre-established credit limit. When a purchase is made, the credit card user agrees to pay the card issuer. Originally the user would indicate their consent to pay, by signing a receipt with a record of the card details and indicating the amount to be paid, but many merchants now accept verbal authorizations via telephone and electronic authorization using the Internet. Electronic verification systems allow merchants (using a strip of magnetized material on the card holding information in a similar manner to magnetic tape or a floppy disk) to verify that the card is valid and the credit card customer has sufficient credit to cover the purchase in a few seconds, allowing the verification to happen at time of purchase. Other variations of verification systems are used by eCommerce merchants to determine if the user's account is valid and able to accept the charge. Each month, the credit card user is sent a statement indicating the purchases undertaken with the card, and the total amount owed. After receiving the statement, the cardholder may dispute any charges that he or she thinks are incorrect (see Fair Credit Billing Act). Otherwise, the cardholder must pay a defined minimum proportion of the bill by a due date, or may choose to pay a higher amount up to the entire amount owed. The credit provider charges interest on the amount owed (typically at a much higher rate than most other forms of debt). Some financial institutions can arrange for automatic payments to be deducted from the user's accounts. For example, if a user had a $1,000 outstanding balance and pays it in full, there would be no interest charged. If, however, even $1.00 of the total balance remained unpaid, interest would be charged on the full $1,000 from the date of purchase until the payment is received. The precise manner in which interest is charged is usually detailed in a cardholder agreement which may be summarized on the back of the monthly statement. The credit card may simply serve as a form of revolving credit, or it may become a complicated financial instrument with multiple balance segments each at a different interest rate, possibly with a single umbrella credit limit, or possibly with separate credit limits applicable to the various balance segments. Usually this compartmentalization is the result of special incentive offers from the issuing bank, either to incent balance transfers from cards of other issuers, or to incent more spending on the part of the customer. In the event that several interest rates apply to various balance segments, payment allocation is generally at the discretion of the issuing bank, and payments will therefore usually be allocated towards the lowest rate balances until paid in full before any money is paid towards higher rate balances. Interest rates can vary considerably from card to card, and the interest rate on a particular card may jump dramatically if the card user is late with a payment on that card or any other credit instrument. As the rates and terms vary, services have been set up allowing users to calculate savings available by switching cards, which can be considerable if there is a large outstanding balance. Because of intense competition in the credit card industry, credit providers often offer incentives such as frequent flier points, gift certificates, or cash back (typically 1 percent) to try to attract customers to their program. Low interest credit cards or even 0% interest credit cards are available. The only downside to consumers is that the period of low interest credit cards is limited to a fixed term, usually between 6 and 12 months after which a higher rate is charged. However, services are available which alert credit card holders when their low interest period is due to expire. Most such services charge a monthly or annual fee. Even some street market stands now take credit cards. For merchants, a credit card transaction is often more secure than other forms of payment, such as checks, because the issuing bank commits to pay the merchant the moment the transaction is verified. The bank charges a commission (discount fee), to the merchant for this service and there may be a certain delay before the agreed payment is received by the merchant. In addition, a merchant may be penalized or have their ability to receive payment using that credit card restricted if there are too many cancellations or reversals of charges. In some countries, like the Nordic countries, banks guarantee payment on stolen cards only if ID card is checked. In these countries merchants therefore usually ask for ID. The credit card was the successor of a variety of merchant credit schemes. It was first used in the 1920s, in the United States, specifically to sell fuel to a growing number of automobile owners. It has been widely regarded that rampant use of credit cards contributed greatly to the Great Depression in the United States that began in the latter 1920s. In 1938 several companies started to accept each other's cards. The concept of using a card for purchases was invented in 1887 by Edward Bellamy and described in his utopian novel Looking Backward. Bellamy uses the explicit term "Credit Card" eleven times in his novel (Chapters 9, 10, 11, 13, 25 and 26) and 3 times (Chapters 4, 8 and 19) in its sequel, Equality. The concept of paying merchants using a card was invented in 1950 by Ralph Schneider and Frank X. McNamara in order to consolidate multiple cards. The Diners Club, which was created partially through a merger with Dine and Sign, produced the first "general purpose" charge card, which is similar but required the entire bill to be paid with each statement; it was followed shortly thereafter by American Express and Carte Blanche. Western Union had begun issuing charge cards to its frequent customers in 1914. Bank of America created the BankAmericard in 1958, a product which eventually evolved into the Visa system ("Chargex" also became Visa). MasterCard came to being in 1966 when a group of credit-issuing banks established MasterCharge. The fractured nature of the US banking system meant that credit cards became an effective way for those who were traveling around the country to, in effect, move their credit to places where they could not directly use their banking facilities. In contrast, although having reached very high adoption levels in the US, Canada and the UK, it is important to note that many cultures were much more cash-oriented in the latter half of the twentieth century (Germany, France, Switzerland, among many others). In these places, the take-up of credit cards was initially much slower. It took until the 1990s to reach anything like the percentage market-penetration levels achieved in the US, Canada or UK. In many countries acceptance still remains poor as the use of a credit card system depends on the banking system being perceived as reliable.